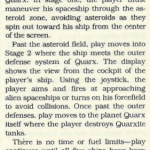 “Planet Quarx is a three-stage video game for the Commodore 64. The object of the game is to reach the planet called Quarx. In stage one, the player must maneuver his spaceship through the asteroid zone, avoiding asteroids as they spin out toward his ship from the center of the screen. Past the asteroid field, play moves into Stage 2 where the ship meets the outer defense system of Quarx. The display shows the view from the cockpit of the player’s ship. Using the joystick, the player aims and fires at approaching alien spaceships or turns on his forcefield to avoid collisions. Once past the outer defenses, play moves to the planet Quarx itself where the player destroys Quarxite tanks. We’re not sure if it is the same game as this, but we doubt it … http://www.gamebase64.com/game.php?id=6087&d=18&h=0 – but someone on the TPUG mailing list has an old copy of it which will not read any more. Oddly the disk says 4040 format, which is for the PET. Could it still be read and saved?